Giveaway is Closed. Winner is Carolyn D.
Attention all moms who have kids who love Skylanders! If your children have been fanatics of the highly popular video game Skylanders, then they are in for a real treat in their breakfast cereals. So, what is Skylanders? Check out sklyanders.com to find out! Beginning in March, for a limited time only, these participating Big G brands will have these exclusive Skylanders packs! 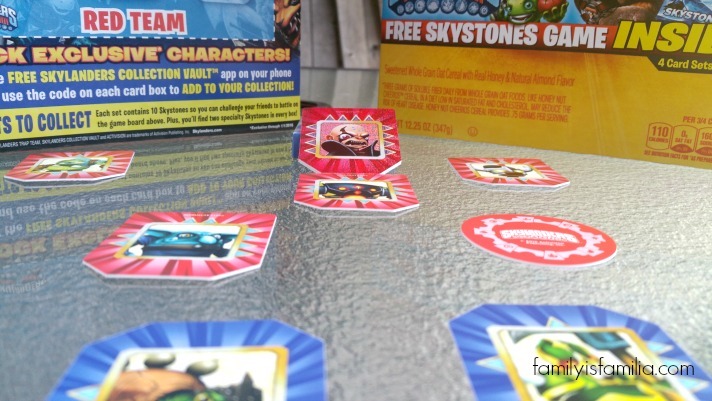 Skylanders fans will find Skylanders Skystones cards playable on the game board printed on the back of the cereal box! Also included are Skylanders coupons, that are printed inside the box! My kids are fans of the cereals. There’s isn’t one cereal on the list that we don’t eat on a daily basis. When your kids see these cereals on the cereal aisle, they’re going to beg you to collect all four Skystones game card sets, each with a downloadable code to unlock characters in the popular mobile Skylanders game. The Skystones game is great for family fun and promotes imaginative and cognitive play! 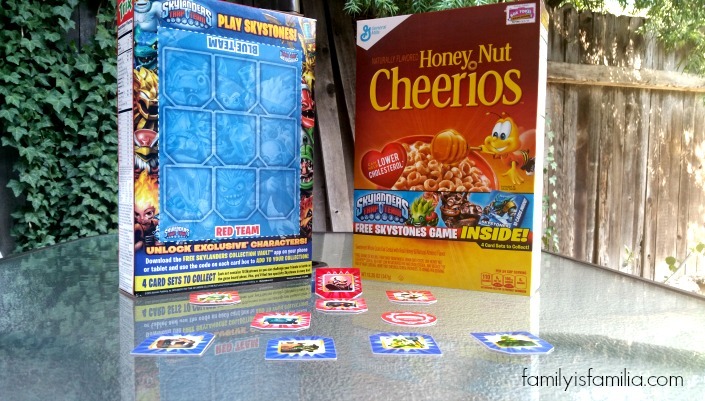 We’re partnering up with General Mills and Skylanders to host a giveaway! I have 2 specially marked, General Mills cereal boxes that include these exclusive Skylanders set. Now, we have no control of the type of game or cereal you’ll win, but surprises are always fun! Which General Mills cereal (listed above) is your family’s favorite? This Giveaway ends Tuesday, March 3, 2015 at 12 noon. Void where prohibited. (1) winner will be selected using Random (dot) org and notified through email. U.S. residents only. Must be 18 years or older to participate. By entering the giveaway, you give me permission to send your info (if you should win) to the sponsoring company, who will ship the prize to you. Sorry, no refunds or exchanges. Winner has 2 days to respond before I select another winner. Entries/Comments that do not follow the submission guidelines will not be counted. No purchase necessary. I follow Family is Familia on Google Plus as Mary F.
Cinnamon Toast Crunch is my boy’s favorite cereal. We love Honey Nut Cheerios here! Honey Nut Cheerios is the family favorite. Reese’s Puffs is a favorite. Our favorite General Mills cereal is Lucky Charms. Reese’s Puffs is our favorite. My favorite is Honey Nut Cheerios Cereal! Thanks for having the give away! Lucky Charms, they’re the best. My favorite cereal is frosted cherios. I have always loved Trix! My whole family loves Honey Nut Cheerios! Cookie Crisp is my favorite! We love both Cinnamon Toast Crunch and Cookie Crisp. Honey Nut Cheerios is the most popular here. Been a fan of Lucky Charms for years now and it has been my favorite since my childhood! Lucky Charms would be a family favorite for sure! My whole family enjoys Cinnamon Toast Crunch. I following Family is Familia on Google+ user Lisa G.
Lucky Charms is our favorite. On Instagram? Follow me there! Subscribe to the blog. Check out the sidebar. All hail to the might Cinnamon Toast Crunch. I’ve actually a few bowls of this cereal for dinner and was happy as a clam. Honey Nut Cheerios is our favorite! 🙂 Thanks. Cookie Crisp would be my cereal of choice! lucky charms is my favorite, followed by Cheerios! Reese’s Puffs are my fave! Honey Nut Cheerios…great to snack on. We love Fruity Cheerios. When I first found this, I thought I was dreaming. 🙂 Hehe. My family loves Honey Nut Cheerios! We always buy the Honey Nut Cheerios. They are definitely our favorite! We add them to snack mixes too. our favorite one is the reeses’s puff.yummy !! Lucky Charms is our favorite cereal! Cookie Crisp is my favorite cereal from the above listings. Thank You for the giveaway…our favorite is Honey Nut Cheerios ! Honey Nut Cheerios are our favorite. The 6 year olds like Lucky Charms–those marshmallows get them every time! I shared this giveaway on Pinterest at https://www.pinterest.com/pin/454793262346679103/. I shared this giveaway on Facebook at https://www.facebook.com/likwan/posts/10152749144082817. I shared this giveaway on Google+ at https://plus.google.com/u/0/107200172263239753322/posts/LRAR7D4oCyx. I shared this giveaway on Twitter at https://twitter.com/likwan/status/572803385256124416. I follow your blog on Google+ under the name Lily Kwan. Of the ones listed, I like Trix!